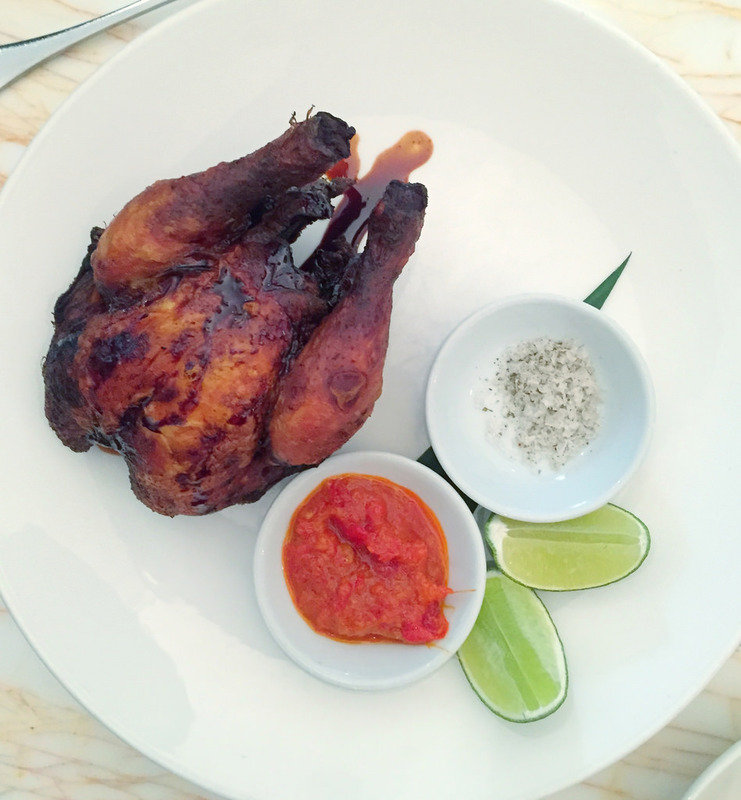 The London food scene has changed a lot since I first started traveling to the UK in the early 90s with my husband, Tim (he was born and raised about an hour outside of the city). Over the years, I’ve eaten plenty of ploughman’s lunches at country pubs, but on a recent trip to London for a food and nutrition conference, I experienced a whole new side of British cuisine. 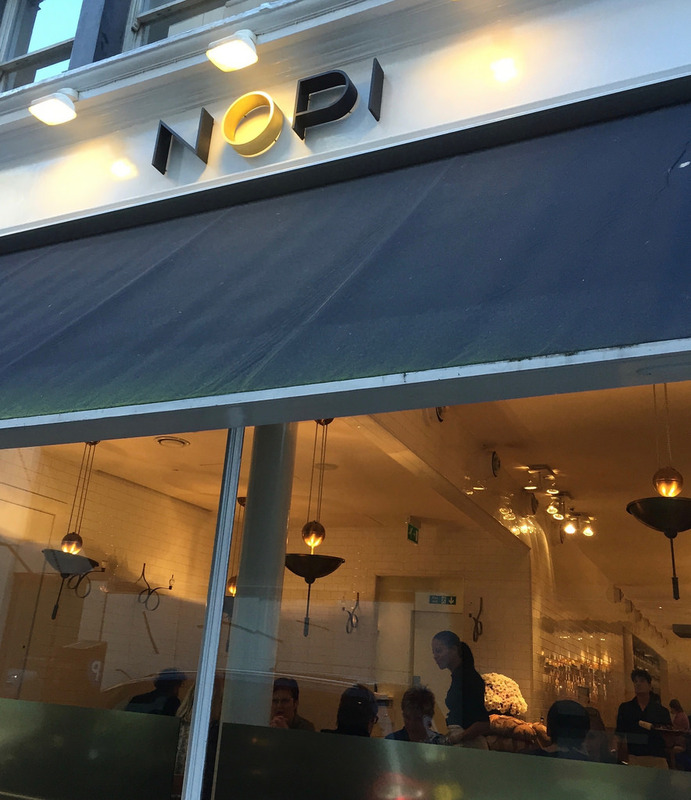 I loved the vibe of this Soho eatery and the more casual communal dining experience downstairs. Besides the food, I also got to meet chef Sami Tamimi who works with Ottolenghi and co-authored some of his cookbooks including Jerusalem and Plenty. 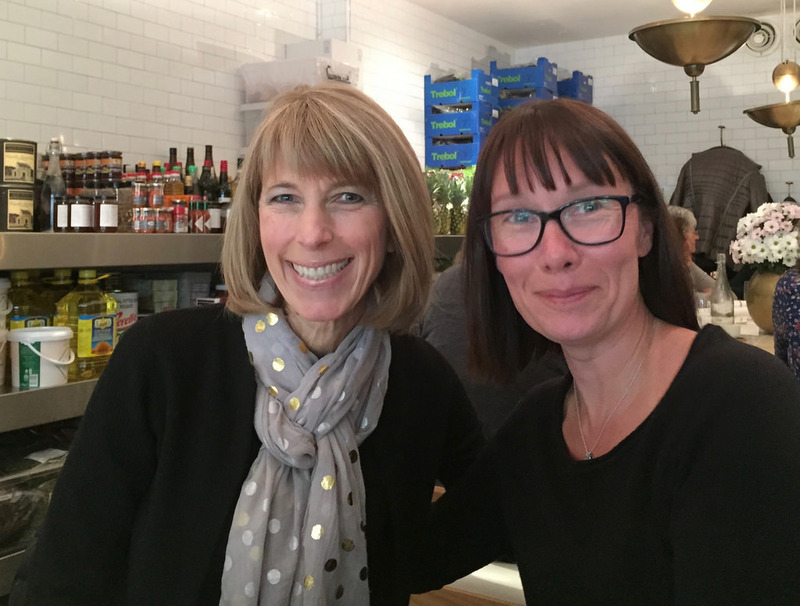 There were 30 dietitians at the conference (our travel and meals were paid for in part by several sponsors), and one of the meals we experienced together took place at St. John Bread & Wine in Spitalfields. Created by chef Fergus Henderson, the restaurant boasts sharing platters (sharing means you get a taste of everything, and that’s exactly how I like to eat), under-appreciated British ingredients, and a commitment to zero waste. Now you’re talking! The restaurant is all about farm to fork and snout to tail, which was quite evident in the Pheasant & Trotter Pie that was served for the main course (translation: pigeon and pig’s feet pie). I’ve never had pig’s feet or pigeon before, so the meal was indeed a new experience. I’m not going to lie — I didn’t love it — but I tried it nonetheless. 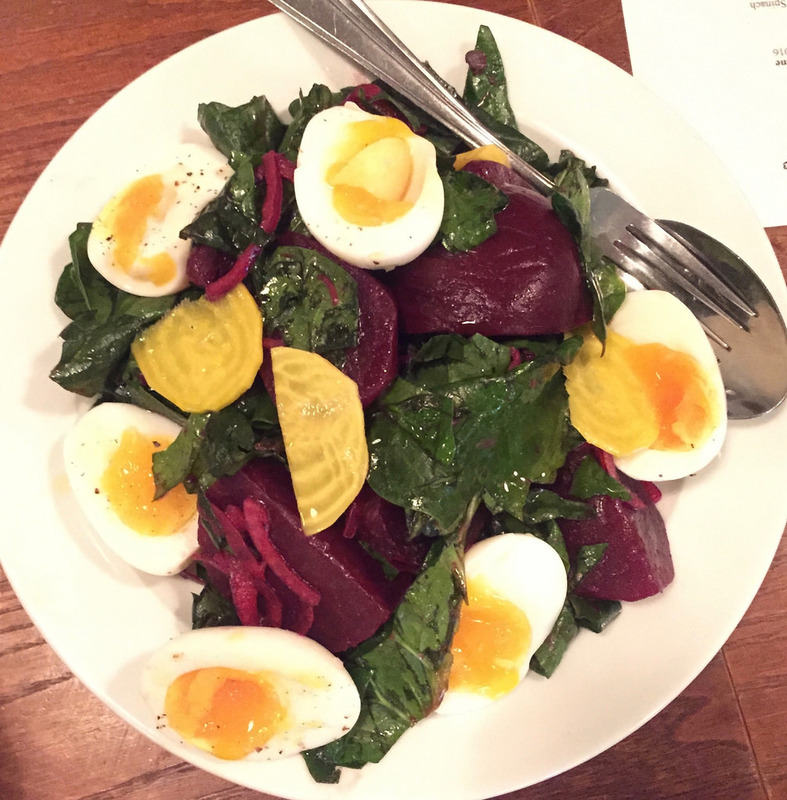 What I did adore was this salad made with Beetroot, Boiled Egg & Spinach. By the way, one of the speakers at our conference, Paul Hannagen, Owner and Head Chef at Cuissson, talked about the new “experience” economy, and he really hit the nail on the head based on all the meals I savored (and experienced) in London. 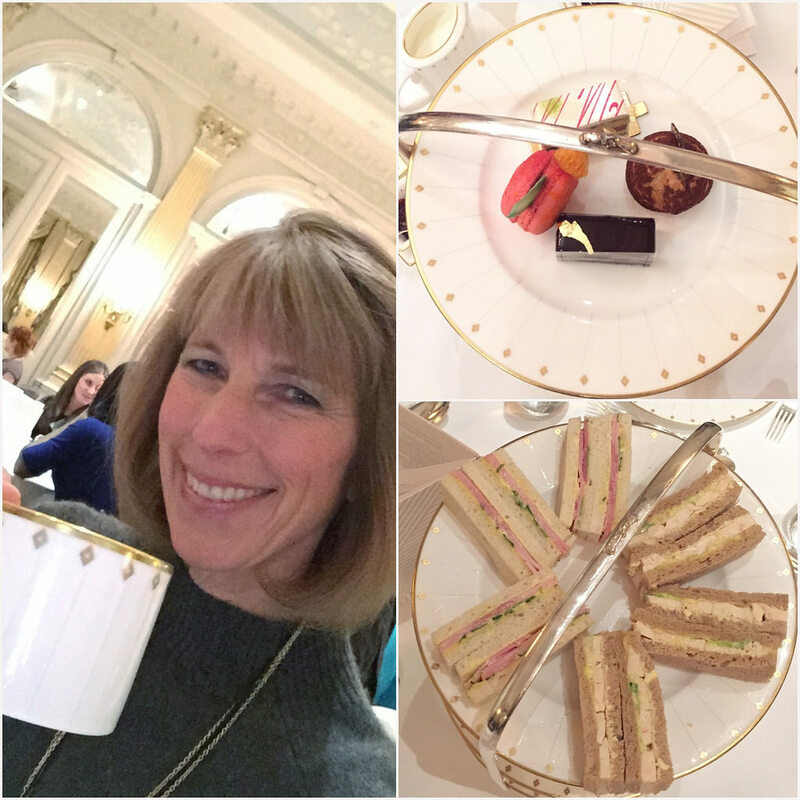 A true London food experience wouldn’t be complete without Afternoon Tea at Claridge’s. It began with a selection of loose leaf teas (I went with my favorite English Breakfast) and an assortment of finger sandwiches including Corn Fed Chicken, Truffled Parmesan Mayo, Rye Bread. I was served scones as well as a selection of hand-made pastries. Blood Orange & Grapefruit Macaroon anyone? From the giant crystal chandeliers and fine china to the contemporary menu, the experience was the perfect blend of old and new. 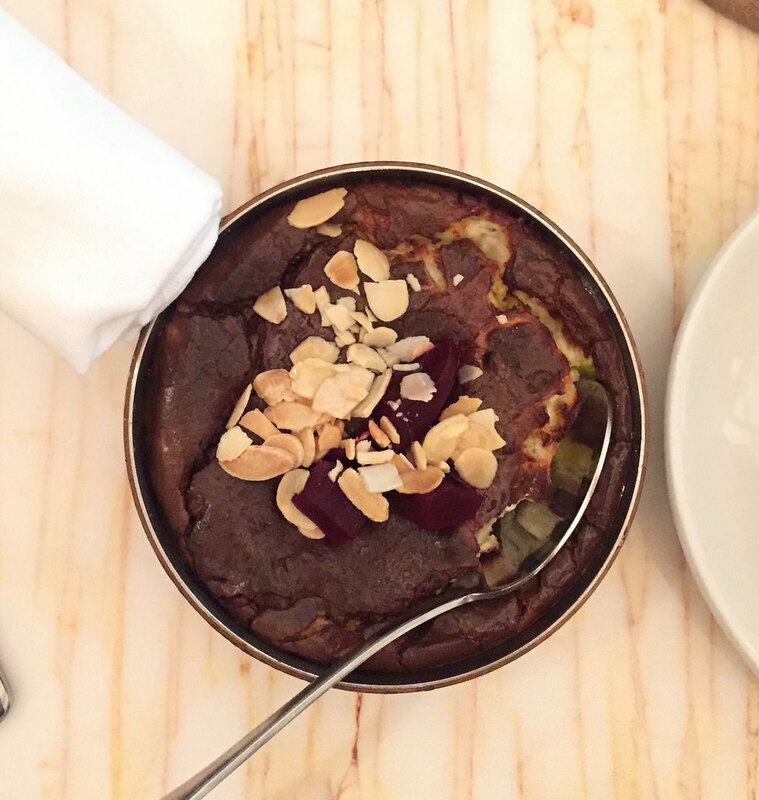 One of the newest and hottest restaurants in London is Fera at Claridge’s, located down the hall from my afternoon tea. I shared a meal there with friends, Carolyn O’Neil and Sarah Jane Bedwell. 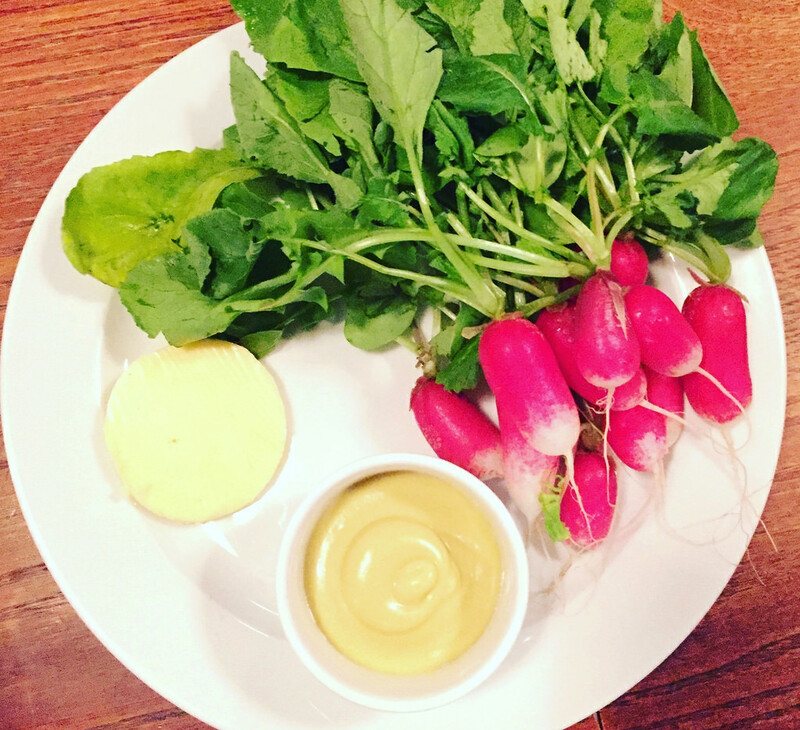 We had a chance to meet chef Simon Rogan and sample his seasonal menu, which the chef describes as a natural take on modern British cuisine. I wish I was there in the day, because the nighttime lighting didn’t do the food justice. 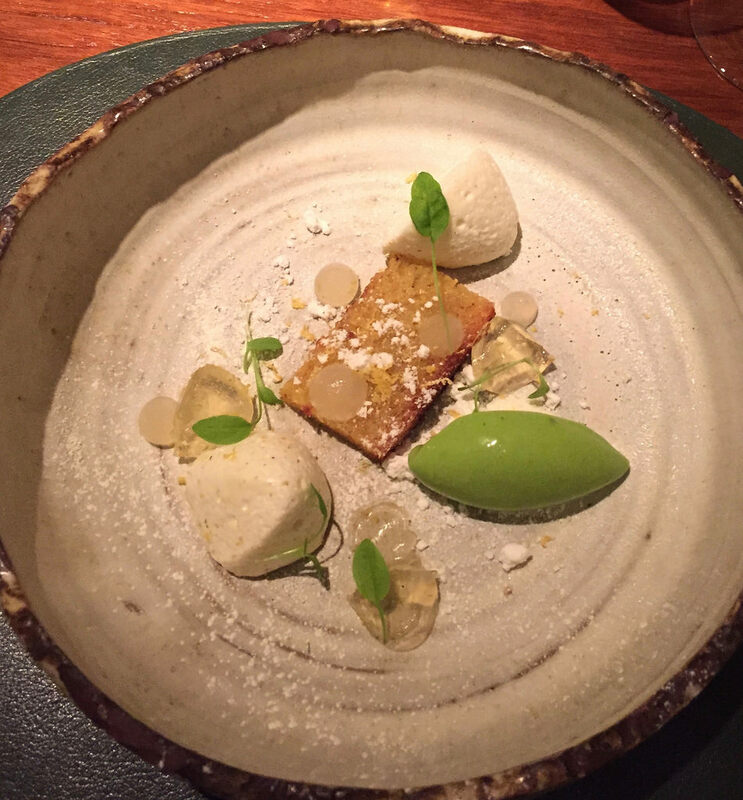 This dessert of sheep’s yoghurt mousse, rapeseed cake, honey, juniper and tarragon ice cream was light, fresh, and interesting (to say the least). 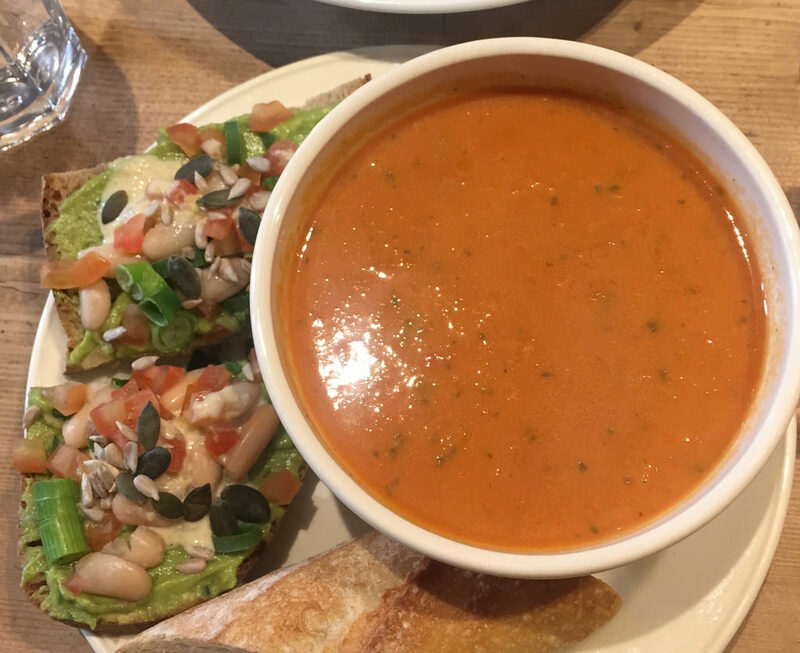 After all that fine dining, I grabbed a quick lunch on my last day at Le Pain Quotidien, a chain of casual restaurants known for their signature tartines (open-faced sandwiches) and fresh, organic breads, salads, soups, and quiches. I have Le Pain Quotidien Cookbook and I’m completely obsessed with tartines (see my recipe for Avocado Toast with Smoked Salmon, Tomato, and Egg), so I was excited to be there. For lunch, I ordered a bowl of tomato soup and this Avocado Omega Boost tartine with white beans, lemon hummus, and toasted seeds. I will definitely be making this at home. 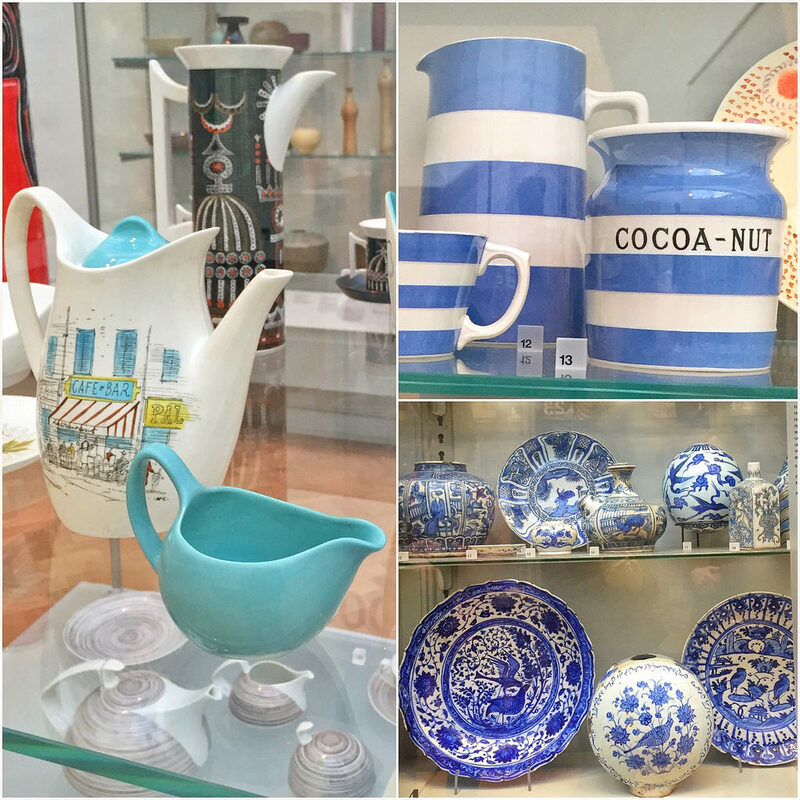 I collect antique flow blue dishes, so I was like a kid in a candy store on my final day in London as I toured the Ceramics collection at the Victoria and Albert Museum. When I return to London, I hope to catch the British Museum of Food, which I didn’t have time to see during my trip.